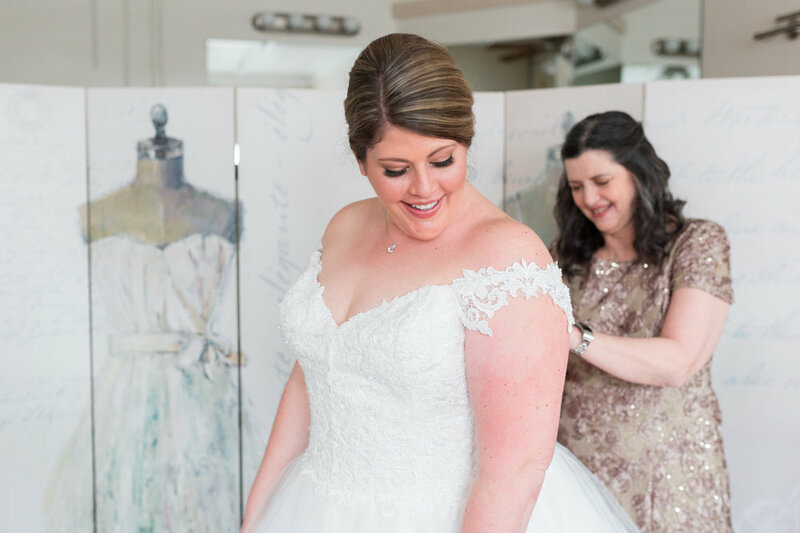 This is Lis Simon real bride Stacy, wearing our Ivette gown with custom detachable sleeves! Stacy grew up in Charlotte, North Carolina, just a state border from Michael, who grew up in Charleston, South Carolina. They met online in 2015, and the rest is history! They were on a cruise to Alaska with Stacy's parents, sisters, brother-in-law, and niece. Since there were eight of them, they brought walkie-talkies to communicate with one another on the service-less ship. After dinner one night, Stacy thought Michael had gone for drinks with her brother-in-law. He had actually gone up to their room and was waiting for Stacy. Over the walkie-talkie, Stacy heard Michael ask her dad to have her go up to their room for a minute. When she got to their room, he was out on the balcony with the ring waiting to propose. They went to find her family right after to celebrate for the rest of the evening. 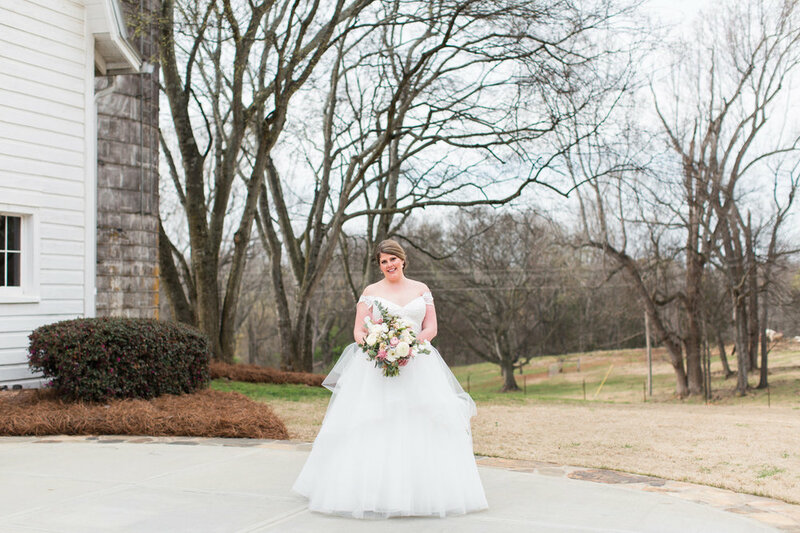 Stacy and Michael got married in Fort Mill, South Carolina. 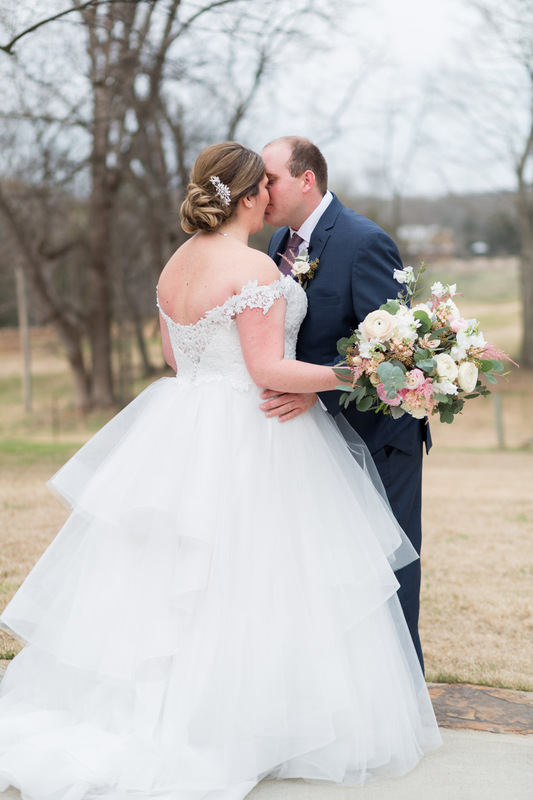 Both their ceremony and reception were held in the Dairy Barn, a lovely events venue. Their ceremony was traditional with a non-traditional recessional song, Signed, Sealed, Delivered, I'm Yours by Stevie Wonder. Once the ceremony was over, it was time to party! The reception was in a large enclosed tent outside and had a DJ, dance floor, bar, and photobooth. The bartender served signature drinks the couple had on the Alaskan cruise when they got engaged. Later in the evening, they passed out headbands, light up glasses, and necklaces to liven up the dance floor, especially since it was St. Patrick's Day! Their decor was a mix of rustic and classy. They tried to embrace the barn aspect of the Dairy Barn by utilizing wooden signs, wine corks, and greenery but also used soft colours and glittery gold sparkles. They let their planner set up the decorations on their wedding day and Stacy "loved how everything turned out!" Stacy's pregnant sister and matron of honour, Amy , was due April 18, 2018. However, a week before the wedding, she had to have an emergency c-section and had her son, Grady, six weeks early. Since we was so early, he had to be in the hospital for several weeks. Fortunately, Amy was able to be at the wedding, but Grady was not. On their wedding day, Stacy's aunt took their wedding bands to the hospital along with a sign that said "Honorary Ring Bearer". Amy dressed him in a premie tux and took his photo with the wedding bands and the sign. It wasn't easy to make it happen, but it meant a lot. In a couple months, Stacy and Michael will embark on a romantic honeymoon. The destination is still up in the air, but they are thinking the Central America/Caribbean area, either the Dominican Republic or Costa Rica. Michael and I had two favorite events. First; after our newlywed photos were complete, my 3-year-old niece, and flower girl, who was watching from across the field got the okay to run to us and she flew across the grass and into my outstretched arms. The three of us collapsed on the grass for a few photos before joining the reception. Second; our first dance to You Are the Best Thing by Ray LaMontagne. Neither of us are particularly phenomenal dancers, but it was actually really fun and both of us really loved it. Do you have any wedding tips and tricks for future brides? Decide on 3 things that you really care about. For example; my 3 were the photos, the dress, and the music. Hire a wedding planner or have a really dependable maid/matron of honor and let them offer suggestions or make decisions for the rest of the planning process. There will be plenty of stress with all the small details, so make sure you focus on 3 things that matter the most to you and let the rest happen on its own! Once the wedding day comes, none of your guests will know if anything goes wrong - so don't let it bother you! It's the only day where everyone has traveled to be there for you and your spouse. Take it all in and enjoy every minute!! Thank you Stacy for answering all our questions and sending us these lovely photos!